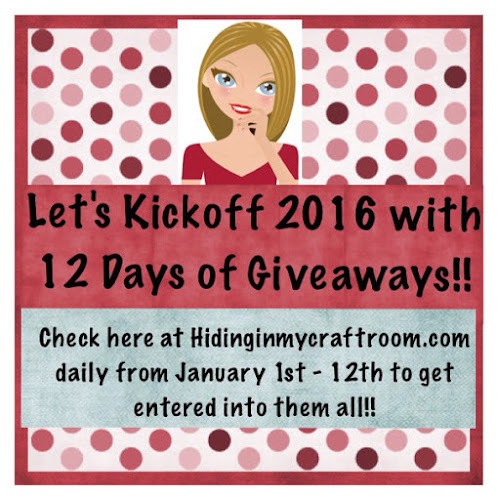 Hiding in My Craft Room: 12 Days of Giveaways! Since things were soooooo crazy during the 12 Days of Christmas I decided to have a 12 Days of Giveaways to kickoff the New Year instead!! Just check back here each evening starting tonight to see what the giveaway is and to leave a comment to get entered! It's that easy!!! Be sure and share with you friends! I'll be back later to post today's giveaway! Happy 2016. Wishing you a year filled with lots of love and laughter. I'll be back later to check out today's giveaway. Sounds like a fun way to start the year! Love it! Happy 2016 to you and yours! I'm up for any of your wonderful giveaways. Happy New Year! Great fun for the new year Laurie, hope it will be a good one for you. I will be back later to check it out. This sounds like fun and VERY generous of you, too! Thank you! HAPPY NEW YEAR! Thanks for doing this. Happy New year!